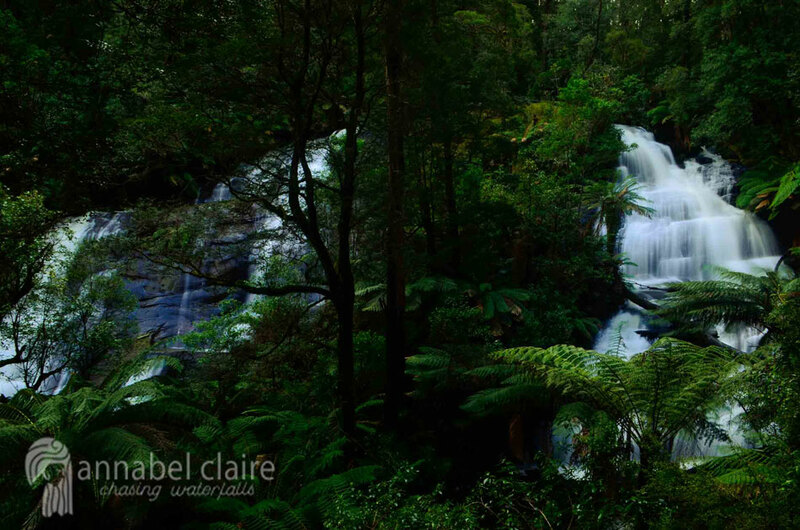 After my venture to Hopetoun Falls, I again hit the road and headed to Triplet Falls. They were only another 25 minutes away. The carpark is located at the end of Philips Track, which begins as a sealed road that comes off Beech Forest Lavers Hill Road. Philips Track then passes the Otway Fly Treetop Adventures, and has an abrupt left-turn, at which point it becomes unsealed and bumpy. Keep following Philips Track, with no further turns, until you reach the carpark (pictured above and below). Facilities include drop toilets and picnic tables. The track to Triplet Falls and Little Aire Falls begins here. There is also an information sign at the beginning of the trail, which is quite helpful. As you can see below, Triplet Falls are a 2km return hike from the carpark. This trail is a circuit which involves three main viewing platforms, and a short walk back to the carpark. However, I’m not confident on how accurate the 1 hr time allocation is. There are lots of stairs, and it will take 2hrs if you choose not to take the loop trail, and turn back the way you came. This is necessary if you also want to visit Little Aire Falls, as the track to them deviates from Triplet Falls after about 200 meters. On the sign above, Little Aire Falls are indicated as a 2.5km hike. This also felt inaccurate to me, but more on that later (blog post on its way). I begun my journey to Triplet Falls first. The trail begins flat and easy, which had me feeling extra confident. Some nice informative signs are also placed along the beginning of the walk. And then. Stairs. Lots and lots of stairs. The stairs are wooden built, with wide sections of earth in between. They felt endless. But finally they came to an end, and another sign indicated the trail to Triplet Falls. Here, the track deviates to the left to Little Aire Falls. Apparently another 2.3kms along. To the right, the track continues to Triplet Falls. I turned to the right to find Triplet Falls. More signs indicated the surrounding nature, and the history of this beautiful place. And then, what do you know, more stairs. I kept my eyes darting around, focused on each step, but also wanting to soak in every inch of my surroundings. Moss clung to everything, and the track was very wet after recent rainfall. However, it wasn’t muddy. In fact, parts of the track are a metal walkway built-up from the ground. It makes it a very pleasant trek. I looked up at the trees to catch a glimpse of the overcast September sky. And continued on through the mossy world. I love learning about nature on these walks. It’s just another aspect of what makes them so great. Then, for a change, some stairs headed upwards. Only to hit another metal structure. Also, don’t forget to keep an eye out for the native platypus! Although, without any (safe) access to Triplet Falls, they might be hard to spot. Then, I reached the first viewing platform, which was mostly obstructed by trees and ferns. It was here that I could see a steep access to the base of the falls. However, considering how muddy it was, there was no way I was going to tackle it. Not on my own. It was too risky, and I know that’s how people have freak accidents. So I wouldn’t recommend this unless it is safe. So instead, I headed up the next staircase. And found my way to the next viewing platform, which was much more impressive. I then made my way to the third and final platform, which provides the best view of the falls. It was here I captured my best images. True to their name, Triplet Falls have multiple sections of rockface. They are nestled amongst trees and ferns. A very unique sight indeed. I admired them for some time. It was difficult to get good photographs, as the platform’s metal barricades were in my way. However, I managed to find some awkward spots to balance my tripod. I would recommend bringing an extremely tall tripod if you’re planning to get great long exposure captures of the falls. After a while of snapping pics, and a diminishing camera battery, I decided to turn back and head to Little Aire Falls. (As opposed to continuing on the loop back to the carpark). Click here to read more about them! I like this one! Looks so secluded and hidden! I wish I could actually test out your directions sometime! Aw thank you! I wish you could too. The trail to this one looks awesome! I wish I could get over to Australia to explore all these cool spots! I love how step by step your guides are, it makes it so much easier to find things and get there!